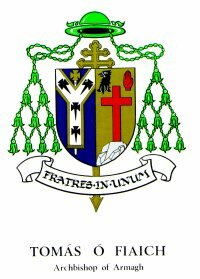 My contribution to this combined tribute to our late Cardinal has some verifiable facts. - like dates from baptismal, marriage and death certificates - but mostly it is memories, as told by people who knew the Fee and Carragher families, or who heard stories handed down from earlier generations. The Cardinal's life, from the time he went to St. Patrick's College, Armagh, is well documented, so most of the reminiscences about the Cardinal himself are of his early years at Cregganduff School. When the good doctor retired and returned to Freeduff, the Fee family moved out, firstly to the "Ambush House", at the junction of the Freeduff-Cullyhannna-Creggan roads. They must have lived there for some time because the junction called "Fees' Crossroads". Later, they moved to the Hughes' homestead, in Oldtown. A headstone in Creggan Graveyard to the memory of the Hughes family shows that Rose's father, Bernard, died on Ist August 1883 and that her mother, Jane, died on 28th September 1855. The three Fee children attended Tullynavall School - a mixed school - where they made friends with the Nelson family, of Freeduff, and this bond of friend remained down the years, until the Cardinal's death. The Fees paid an annual visit to Nelsons every January and vice versa. When the Fees came to Nelsons, the older retired to the parlour to discuss their affairs, while the younger folk - Travers Ferguson, Patrick and Tom Fee and a Miss Bell, who taught in Tullynavall School stayed in the kitchen. Tom was the life and soul of the group and a great favourite of Miss Bell's. He played an accordion, which the Nelsons had, and sang and danced. Patrick was more reserved. All down the years, Father Tom visited the Nelsons at once a year and, in later times, he paid an annual visit to Travers Ferguson. Cregganduff National School was built in 1889 and one of the early teachers - if not the first - was a Master Hurl, who lodged with the Fees, when they lived in "Ashfield House". Patrick Fee became a monitor at the school, before going to Patrick's Teacher Training College, Drumcondra, Dublin, where he qualified in 1904. It seems he taught for a short time in Castlerock, before returning to Creggan School on lst January 1905, where he remained until his retirement in 1947. There isn't a lot of information about the Master's early life. He was quite a reserved man but, when asked to sing at a gathering, he had a party-piece, "Hooligan's Christmas Cake". He married Annie Carragher on 8th January 1920. The event was marked at school by a party and the distribution of boiled-sweets. Annie was the daughter of Patrick Carragher and, Annie Carragher, off Annaghmare. Patrick was a spirit-grocer and was known as the "Spriggerman Carragher", because he bought spriggered or embroidered lace from around the countryside and then sold it. The spirit-grocer was licensed to sell spirits for consumption off the premises. However, all such establishments were known to sell drink, which was consumed on the premises. When a police raid was imminent, all evidence of illicit drinking was quickly removed. Annie was one of three children, the other two being Patrick, who became a priest and died in the U.S.A., and Tommy, who married Minnie Rice. Annie did her teaches training at Our Lady of Mercy College, Carysfort, Dublin, where she qualified in 1905. There is no evidence to suggest that she ever entered the convent as a postulant. Perhaps, her sojourn at the convent for teacher-training was misconstrued. She taught for a time in Newtownhamilton and lodged with the Mooney family, who lived on the Square. A life-long friendship developed between the families and a fitting climax 1 the story was told by Kathleen Mooney. 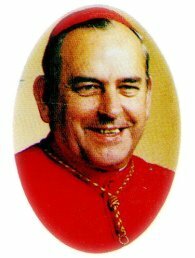 She was present at the Cardinal's first Mass on 6th June 1948, in Cullyhanna, and at his last Mass, on 8th May 1990, in Lourdes and was privileged to have been one of the dozen-or-so people to whom the Cardinal gave Holy Communion on that eventful day. 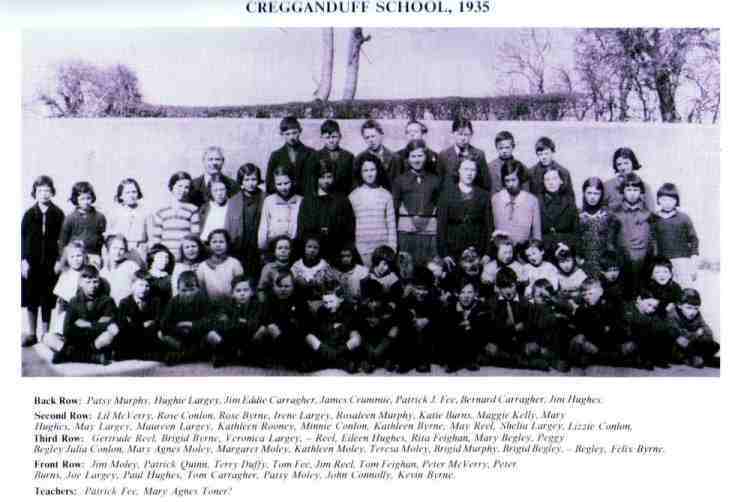 On lst October 1911, Annie took up an appointment to Cregganduff School. She may well have known the Master before this but obviously the friendship develop and, as previously stated, they married on 8th January 1920. They went to live in the "Pink House", in Urker, in the parish of Upper Creggan. The house belonged to the family of the late Hugh and Susan Largey. My grandmother, Catherine Largey, sister in-law to Hugh, was appointed guardian of the couple's orphan children, and of the property, and it was she who let the house to the Fees. She, too, had a life-long friendship with the Fee family. She was born in Oldtown and probably knew Master Fee in her young days. My earliest recollection of meeting the family was at my grandmother's house, our weekly Sunday visit. The Master was a regular visitor to the house, on his way home from school each evening. Like the Fees, she, too, was a great admirer of Eamon De Valera and faithfully bought "The Irish Press" from its first edition in September 1931. By the time the Master arrived in the evening, she had all the day's news digest and the two friends discussed the issues of the day, while the children, to whom he gave a lift to school, sat outside in the car. 1 spoke to a woman who well remembers sitting in the car during the cold winter evenings. She said that they were not allowed to move around or get out of the car. 1 remember one incident after young Tom had gone to St. Patrick's College Armagh. The Master had given my grandmother an essay, which Tom had written his first term. 1 can't remember the exact title but it was something like "The Beauty Of My Own Country". When 1 arrived on my Sunday visit, 1 was ushered into the parlor given pen and paper and asked to write an essay on the same subject. When 1 completed the composition, all present compared the result with young Tom's. verdict - a bit one-sided, perhaps - was that mine was a better essay. Patrick Fee was born on 21st September 1921, while the family lived in the "Pink House", in Urker. He was baptised in Cullyhanna and his sponsors were Michael Largey and Mary Arm Fee. The address given at the time of baptism was Annaghmare. The family had obviously intended to return to live in Annaghmare. My sister remembers our grandmother telling the story of how my mother, then Cissie Largey, was dispatched for Nurse Burke, as the birth of the baby was imminent fell off her bicycle and broke her leg. My aunt, Ethel, was then sent in her place seems my mother had been asked to be one of the baby's sponsors but, because of her broken leg, she was unable to attend, so my uncle, Mick Largey - "Big Mick" took her place. When Patrick was about two years old, he became very ill, causing hot Master and Mistress to miss school for several days. Thomas Fee was born on 3rd November 1923, at Annaghmare, though the address on the baptismal register is given as Sheetrim. Perhaps, this ambiguity can be explained by the fact that the townlands of Sheetrim and Annaghmare adjoin at the house in which he was born. 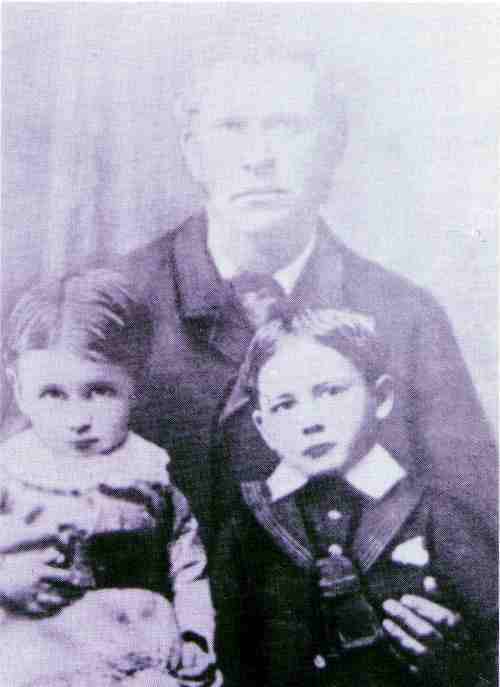 He, too, was baptised in Cullyhanna and his sponsors were Thomas Carragher and Elizabeth O'Neill. During the early years of their marriage, the Master and Mistress went to school on their bicycles. The Master's first car was a Model-T Ford, which had a canvas roof and celluloid side-windows. His next car - and last - was a Morris 8, registration number IB 8095. The Master was a poor driver and was known to burn out the clutch regularly. School contemporaries of the Cardinal remember being sent out on to the main road at Moley's shop, to wave the Master's car out, when the road was clear. Family life was shattered, when Mrs Fee discovered a lump on her breast, while on summer holidays ill Blackrock, Co. Louth. She went to a Nursing Home in Dublin. where cancer was diagnosed and all operation performed. Unfortunately, the operation was riot successful and she returned home to a long, painful illness. She died on 28th January 1932. She was obviously aware that she was going to die, for she had the house done-up by Larry Carragher and she left instructions for the route of he funeral, which went by Kiltybane and Lisleitrim to Cullyhanna. She instructed young Tom to stand out at the front door, as the cortege came out, and to look up toward heaven, where her soul was going. She was nursed in her last illness by Nurse Burke. Local knowledge suggests that the Cardinal's aunt, Mary Ann, came to live with the family during Mrs Fee's last illness and that his uncle, James, came to live there after Mrs Fee's death. Both boys attended Cregganduff School for their primary education. The remembered as scholarly children. 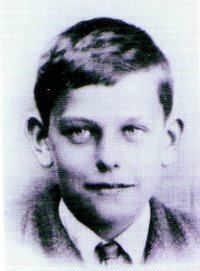 Patrick was very quiet and studious, very like his mother in looks and temperament. Tom was like his father in appearance, had an out-going personality and made friends very easily. He was fond of playing pranks at school and often got into trouble with the Master because of his high-jinks. Once, while Tom was playing football with his friends on the rock behind the school, a boy got hit in the face with the ball, which consisted of an outer leather cover stuffed with rags. Whether the boy was seriously injured or not, we don't know, but we know that the Master heard of the incident and meted out punishment to all the footballers. -this obviously nettled young Tom - about ten years old at the time - who proceeded to compose a ballad of about nine verses, denouncing both the boy and the punishment. Another time, when Tom's class was stumped by a sum, he volunteered to get the answer-book, which was totally out of bounds to pupils. While walking towards the Master's desk, he was addressed by his father: "Tom Fee, what do you want?". The Master always addressed him as Tom Fee. Tom replied: "A blotter, Sir". He succeeded in getting a peep at the answer-book, while pretending to look for blotting paper. The Master had a habit of keeping the class in past the lunch-hour. One lovely, sunny day, he did just that and, when the class was eventually allowed out, Tom burst through the door and shouted: "Up De Valera". There was an election on at the time. The Master dashed out and gave him two slaps, saying: "That's your politics for you, Master Tom Fee". Little did either of them realise then that, forty years on, the De Valera family would invite Monsignor Tomas O'Fiaich to preach at the funeral of the late President of Ireland. Arithmetic books at school were required to be ruled, so that the sum could be set out clearly, and all rough-work was required to be done in the column at the side. Tom always managed to do some calculations in the middle of the sum and then draw circles around them, which spoiled the effect and got him into trouble as well. If he thought a child had no pen or pencil, he would slip up to the Master's press and "pinch" one, to save the child getting into trouble. He was known to have been a fluent Irish-speaker at the age of ten and could read an Irish column, which appeared in the daily paper, brought to the school by the postman. The paper was, no doubt, "The Irish Press" which, from its first publication in 193 1, was the Master's favourite daily. 1 would like to thank all those who have helped by their contributions to put on record something of the history of the Fee family and of the Cardinal's school-days.